MainAll NewsMiddle EastFatah to Hamas: What have you done for the Palestinians? Fatah to Hamas: What have you done for the Palestinians? 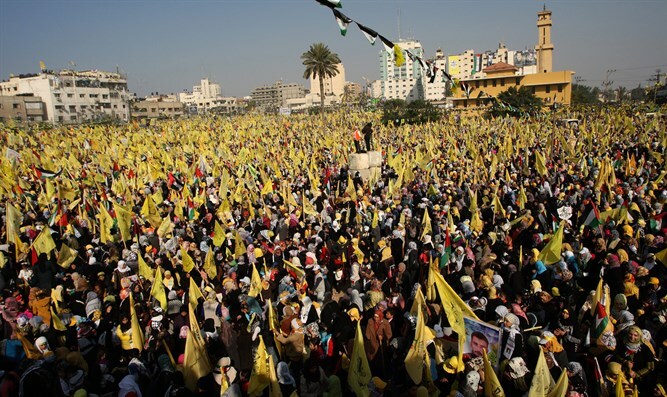 Fatah accuses Hamas of seeking to enshrine the status of Gaza as an independent entity. The Fatah movement, headed by Palestinian Authority (PA) chairman Mahmoud Abbas, is ramping up its attacks on its rival Hamas. On Sunday, Fatah blasted deputy Hamas leader Khalil al-Hayya, who called for the establishment of a “national rescue front” in light of Abbas's actions which, he claimed, harm the national interests of the Palestinian people. In an official statement, Fatah claimed that Hamas had formally agreed to a plan of a Palestinian state with temporary borders and/or a Palestinian state in Gaza without Jerusalem, the Al-Aqsa Mosque and the Al-Buraq Wall (the Western Wall), in a manner that would allow Israel to control Judea and Samaria. The statement accused Hamas of sowing division in the Palestinian arena, thereby serving the Israeli plan to separate Gaza from Judea and Samaria. Fatah stressed that the PA leadership, led by Abbas, has not given up on any basic principle of the Palestinian people that was approved by the Palestinian National Council in 1988. "We ask Hamas calmly: What have you done for the Palestinian problem on the political level, beyond uttering slogans...and what did you do to keep the Palestinian people steadfast on its land?" said the Fatah statement. Fatah and Hamas have been feuding with one another since 2007, when Hamas violently took over Gaza in a bloody coup. Since the unity government was dissolved, Hamas and Fatah have held several rounds of reconciliation talks in Doha, Qatar – but with no success. In recent weeks, the PA appears to have officially recognized that it has lost control over Gaza and that an independent Hamas-controlled political entity exists there and has upped its rhetoric against Hamas as a result.